We are proud to hold the title of one of the most accessible companies in our industry having over a dozen service centers across Canada to serve our clients. 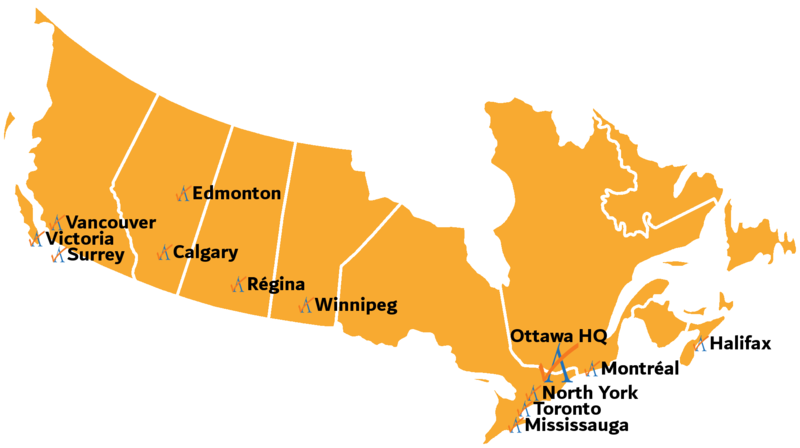 There are ALSC authentication and legalization service centers in Victoria, Vancouver, Surrey, Calgary, Edmonton, Regina, Winnipeg, Ottawa, Toronto, North York, Mississauga, Montreal and Halifax in order to provide a quick safe solution for your international document. The purpose of our service centers is to save you time and money. Instead of going to your nearest post office and waiting in line to send your documents via Canada Post, after an appointment is made, you can come to one of our service centers near you and get free shipping via overnight courier to our head office in Ottawa for processing. Once your documents have been completed, they get free shipping back to any one of our service centers in Canada for pick up. In almost every case, if you have Canadian documents that need to be used overseas, whether in Europe, South America, the Middle East, Africa, or Asia, your documents will have to come to Ottawa for authentication at Global Affairs Canada and likely the embassy of the country where you will use your documents; most of those embassies are in Ottawa as well. In other words, our service centers do not process your documents on the spot; they can’t! This is sometimes confusing for our clients which is completely understandable as authentication and legalization can be a very confusing process. If you are interested in using our service centers to have your Canadian documents authenticated and legalized for use in the country of your choice, you will first have to contact our headquarters in Ottawa. Specifically, you will have to confirm use of our services once one of our agents has provided you with a quote. Our service centers are available by appointment only and this appointment must be made through our head office. If you fail to make an appointment through our Ottawa office to use any one of our service centers across Canada then your documents may not be accepted for processing. As the first provider of this service and with over 25 years experience in the industry, we know that there are deadlines to meet and this can make it very stressful to wait. However, proceeding without assistance and instruction from our agents at our Ottawa office will simply cause delays and add unnecessary complications to an already difficult process. Thankfully, when you choose our services you can reduce your processing time by 20 business days on our priority same business day authentication service. Global Affairs Canada can take up to 20 business days to authenticate your Canadian documents. However, with our services one of our agents will personally present your documents to Global Affairs Canada for authentication during their limited operating hours on the same day your documents arrive at our office. The second step of legalization is often more complicated than the first step of authentication because of all of the additional requirements and fees which are subject to change. As we have worked with foreign embassies in Canada for over two decades, we have become experts at maneuvering through the changing requirements and all of the common issues which arise. Indeed, it is our service guarantee that your documents will be properly authenticated and legalized for use in the country of your choice. Whether for personal or corporate purposes, ALSC is here to help you get your documents ready for use overseas. Click below to get started!